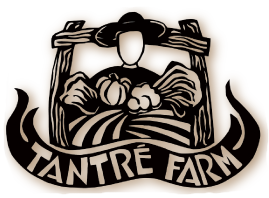 Tantré Farm has been an organic farm since 1993. We are located about 20 miles west of Ann Arbor, Michigan. Our fruit crops include strawberries, raspberries, blackberries, pears, melons, and more depending on the fruit weather. We grow about 80 to 100 varieties of vegetables, mushrooms, and a small variety of herbs and flowers. In addition to that, we have a dog, some cats, a small flock of egg laying chickens and ducks, a few pigs, and a small herd of cows. We sell our produce through CSA shares, at various local stores, restaurants, and also at the Ann Arbor and Chelsea Farmers Markets. Our farmland has grown to about 115 acres of wetland, woods, and sandy-loam fields. 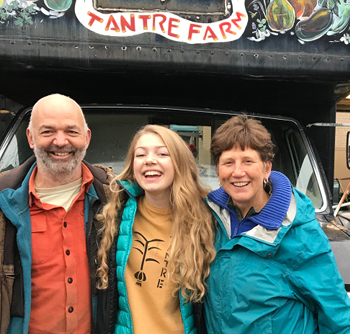 Richard and Deb, along with their daughter, Ariana, live on-site year round. Seasonal workers or interns join them for various parts of the year, living and working together.